The German team arrived at Algeciras on the Spanish coast on Wednesday 24 July 1940, accompanied by Spanish Minister of Air Juan Vigón, taking rooms at the Reina Cristina Hotel with its spectacular views across the bay to the Rock of Gibraltar. Canaris liked Algeciras, where his Madrid head of station Wilhelm Leissner (alias Gustav Lenz) had set up an early Abwehr war station or KO during the Spanish Civil War, before moving on to San Sebastián. A man called Albert Carbe now ran this Kriegesorganisation from the Villa León. He was a former Siemens manager in Málaga who had also been a German consul in Algiers. He was now pretending to be a German and Italian consular official, while actually running agents among the Spanish workmen who crossed the frontier every day into Gibraltar, as well as keeping paid informants inside the Guardia Civil and the carabineros who guarded the border. He was assisted by Major Fritz Kautschke, who had been ejected from the German artillery because he had Jewish ancestry and given an Abwehr foreign posting by Canaris out of pity. The Abwehr’s relations were also very tight with Spanish military intelligence in Spain’s Campo de Gibraltar, where Lieutenant Colonel Eleuterio Sánchez Rubio Dávila recruited agents for them and passed on information, assisted by Comandante Ignacio Molina Pérez. Sánchez Rubio had form in Gibraltar. He first came to the Rock before the civil war as a right-wing refugee from the Spanish left. He bought an oil-shop at 29 Irish Town and had many friends and acquaintances in Gibraltar. In August 1937, SIS in Spain had alerted MI5 and the Defence Security Office that Major Sánchez Rubio, described as ‘a member of General Franco’s military delegation attached to the command of General Queipo de Llano’, was showing too keen an interest in the Upper Rock fortifications and guns, and was offering bribes for the names of British intelligence officers and anti-Nationalist ‘Reds’ on the Rock. The Canaris team drove to La Línea de la Concepción and scanned the North Front of Gibraltar with binoculars from the top of the military headquarters. Looking south over Spanish pill-boxes they could see where the few shade trees had been felled and the British ‘dragon’s teeth’ laid across the road, concrete pyramids to impede tanks. Beyond the sunburned grass of the emergency landing strip lay the cemetery where the Deutschland sailors had been buried and exhumed, then barbed wire and minefields and ant-like men labouring on new British defences along Devil’s Tower Road and in the galleries of the sheer cliff face. The isthmus would be the battlefield for any German assault force. They would have to cross the narrow neck of land from Spain to Gibraltar, in the aftermath of a heavy artillery bombardment. The British put up the iron border fence between Spain and Gibraltar in 1908, and the Spanish had recently reinforced the neutral ground that lay between that fence and the town. In May 1939, the 20th Company of Engineers of the 112th Division of the Spanish army had arrived in La Línea to begin fortifications. From August 1939 the Spanish army were also using Republican prisoners to help install a chain of concrete bunkers, tank-traps, pill-boxes and barbed-wire fences between la verja, the British fence, and the Spanish border town. During the digging, the Spanish chief military engineer, Pedro Jevenois Labernade, a man of Belgian ancestry, was delighted to discover archaeological remains of the original chain of fortifications across the isthmus, la línea de contravalación (from which the town took its name), constructed from 1730 onwards by another Belgian, the Marquis of Verboom. Jevenois was proud to redraw the old battle line. From the Algeciras observation posts at the Villa Saladillo, and from the lighthouse at Punto Carnero, Captains Witzig and Osterecht concentrated on spotting the positions of the British defences against aerial attack, and studying the vagaries of Gibraltar’s winds. The geography of the Rock made surprise from the air impossible. Any aeroplanes slowly towing gliders would be vulnerable to concentrated anti-aircraft fire. The steepness of its slopes gave the Rock a natural defence against air landings. The only places where gliders or parachutists might possibly land on Gibraltar were on the two plateaux at the southern end of the peninsula. The upper one is called Windmill Hill Flats or Buffadero, and the lower one, where the lighthouse stands, is Europa Flats. But once again, Gibraltar’s geography was its saviour, because the very bulk of the high Rock played havoc with the air currents. Witzig could see that the violently erratic winds at Windmühlenhügel, as he called Windmill Hill, would scatter parachutists or blow them into the sea. Meanwhile, Hans Mikosch’s new Spanish friends had arranged for the regular Seville–Ceuta passenger plane to fly closer to the Rock than usual so Mikosch could make aerial observations, and the gunner Wolfgang Langkau was working out what artillery would be needed to shell Gibraltar’s harbour and batter its defences. It may have been at German suggestion that the Spanish at this time shifted four twelve-inch mobile howitzers from Mount Bujeo to the Sierra Carbonera. The German reconnaissance team went to bed for their second night at the Reina Cristina Hotel. At around 1.30 a.m. on Friday 26 July there was a series of explosions. From their balconies the Germans could watch the Rock across the bay being bombed at night. Spiky searchlights probed the sky. Witzig said later it was just like watching a spectacular film in the cinema. The hostile aircraft, which were almost certainly Italian, were bombing from north to south, and so the reconnaissance party could track all the British anti-aircraft guns in turn from left to right as they put up a moving curtain of fire in a co-ordinated ‘box’. The muzzle flashes of the guns, reflected off the low cloud, gave away their positions while the size of the flash indicated their calibre. Was it just an accident that the air raid coincided with the visit of the German reconnaissance party? Or was it co-ordinated with the Italians? The greatest expert on the German plans for Gibraltar, local historian Alfonso Escuadra, says it was pure chance (‘totalmente fortuita’). It is true there is no hard evidence of co-operation. But what a stroke of luck for the experts to observe the dispositions! The night’s events confirmed young Rudolf Witzig in his judgement that trying to take Gibraltar by glider or parachute assault alone would be suicidal. That was his main contribution to the discussions in Madrid on 27 July when the group pooled their ideas, and it was the conclusion of his three-page report in the dossier that Canaris delivered to army headquarters in Berlin on 2 August 1940. The day that the Canaris–Mikosch group arrived in the Campo de Gibraltar, 24 July, Hitler had sent for Wolfram Freiherr von Richthofen, the former head of the Condor Legion who had just been promoted to General der Flieger. They talked not about the current European operation, the Luftwaffe clearing the skies for the invasion of Britain, but about Spain. Hitler wanted Richthofen to use his old relationship with Franco and the top Spanish generals to try and persuade them to forge an alliance with Germany. 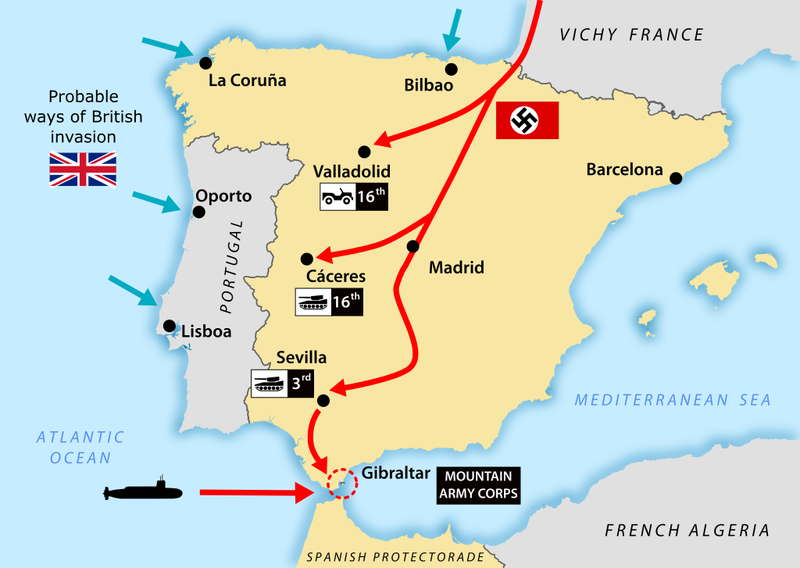 Hitler ordered Richthofen to tell the Spanish he would help them to get back Gibraltar, following which there could be further territorial compensations for the Spanish in North Africa. Hitler said this attack on Gibraltar could be a joint effort if the Spanish wanted to take part. Once again, Germany would be offering to provide heavy artillery, anti-aircraft guns, fuel and ammunition. Wolfram von Richthofen flew to Biarritz and met his old friend General Juan Vigón, who, acting on Franco’s instructions, gave the usual story: Spain was still unable to commit to entering the war. They admired Germany and her astonishing victories, and wanted her to win even more, but current circumstances … the civil war … not enough food or fuel or equipment … They needed enormous German support. Vigón laid on the flattery, claiming that Franco had already sent a message to Hitler asking for Richthofen himself to be assigned as commander of the German troops if the operation went ahead. On 8 August 1940, Baron von Stohrer, the German ambassador in Madrid, sent a ‘Strictly Secret’ memorandum to Berlin about the conditions under which Spain would enter the war. It included the Canaris shopping list of military supplies as well as the economic and territorial demands of the Spanish government. Basically, they needed petrol and bread: Spain only had enough oil for six weeks of war, and wheat for maybe eight months, with strict rationing. In land terms, they wanted Gibraltar, all of French Morocco, Oran in Algeria and the enlargement of the Spanish colonies in Río de Oro and the Gulf of Guinea. In his memorandum, Ambassador von Stohrer weighed up the pros and cons of Spain joining the Axis and taking Gibraltar. The plus side would be a great blow to British prestige, the cutting off of Spanish supplies of iron, copper, pyrites and other minerals to the UK, and Spanish control of the Strait of Gibraltar. The disadvantages to Spain were that if the British got wind of the plan they might well jump the gun and attack Spanish territory first. They might occupy the Campo de Gibraltar, or the Canary Islands, perhaps even the Balearics. Spain did not trust the French General Noguès in Morocco; Anglo-French operations against Tangier and the Spanish colonies in Africa might follow. There could be consequences in Portugal, too: the British could occupy Lisbon or Lagos and then attack Spain from the west. Above all, since Spain did not have sufficient food and fuel to keep people happy, military setbacks could trigger domestic riots. Continuing in this negative vein, Baron von Stohrer laid out the transport difficulties for the German military. The only way to get the tanks and heavy artillery into Spain from German-occupied France over the Pyrenees was via the rail and road links that ran from Bordeaux to Hendaye on the border. But the trains would have to be unloaded and then reloaded, because the gauge of track was different in France and Spain. The rail lines ran from Irún on the frontier to San Sebastián and then via Burgos and Madrid down to the south; all major lines passed through Madrid, so there were no secret back-country tracks along which you could run tanks and guns covertly. The road route through the middle of the mountains from Saint-Jean-Pied-de-Port to Roncesvalles was too narrow and twisting, only suitable for light trucks and passenger cars, so all the heavy equipment would have to go from Bayonne to San Sebastián where, for long stretches, both road and railway were visible from the Bay of Biscay and thus open to bombardment by warships of the Royal Navy. The ambassador suggested camouflaging the movement of gasoline and ammunition and only bringing the big guns south at the very last minute. His ultimate conclusion was that bringing a weak and vulnerable Spain into the war too early was dangerous. They must wait and see how the campaign against England developed. In Berlin, Warlimont’s planners worked up the Canaris–Mikosch survey into an outline plan of devastating attack. If Gibraltar could not be taken by secret commandos or by parachutists dropping from the air, then it would have to be done the hard way, by infantry fighting over the land bridge of the isthmus and through the northwest corner of the peninsula below Moorish Castle. Leaving aside what the Spanish armed forces might or might not contribute, the planners reckoned a German assault would require two infantry regiments, including a mountain regiment, three battalions of combat and construction engineers with special vehicles, and a company of men to deal with land mines. Up to a dozen artillery regiments with howitzers and heavy AA guns would be needed to take out the deeply embedded British casemates and embrasures. Around 170 guns would be used to give the Germans a three-to-one advantage. Heavy artillery fire, combined with the German air force, flying at first from Bordeaux and then from nearer Spanish airfields, would drive away the British fleet. That would allow more Stukas and other dive-bombers to destroy anti-aircraft gun sites, sink all surviving ships, smash up the town, block known tunnel entrances, wreck all communications. Once the aeroplanes had done their work, the artillery would start again, this time with a hail of four or five thousand rockets bringing down even more destruction. Then, with the defenders reeling in shock, the German assault force and combat engineers would move across the open ground to the North Front. Assault boats would also cross the Bay of Gibraltar from La Línea to attack the Old Mole. The objective of the first day would be to take the Rock’s northwest shoulder with Moorish Castle. In three days of hard fighting, Warlimont’s men assessed, the whole Rock would be theirs. Warlimont handed the plan for what would become Unternehmen (Undertaking or Operation) Felix to General Jodl on 20 August 1940. Two days later Captain Anton Staubwasser of the military intelligence staff appended his accurate estimation of the British enemy land forces holding Gibraltar Fortress: a garrison of ten thousand men, comprising five infantry battalions with artillery, engineers and service troops, enough food for eighteen months and a system of tunnels, galleries, firing-points and shelters dug deep inside the Rock. The Royal Navy’s Force H arrived back in Gibraltar on the evening of 20 August, escorting Admiral James Somerville, returning from a trip to the UK, aboard his new flagship, the fifteen-inch-gun battle cruiser HMS Renown. That night, there were three air-raid alerts. In the first attack, bombs were dropped in the harbour ‘about a cable and a half’ (three hundred yards) from HMS Cormorant, the Gibraltar naval base. The aircraft was picked up and held by the searchlights just before bomb release but the shore batteries and ship’s anti-aircraft guns were slow to fire. When they did engage, a salvo from the twin 4.5-inch quick-firing AA guns of Renown winged the bomber, which crashed a mile or so west of Europa Point. From a salvaged chunk it was identified as most likely an Italian Savoia-Marchetti SM.79 Sparviero (‘Sparrowhawk’). Somerville took a piece of the crashed aeroplane to Government House at 11.30 a.m. on 21 August for the reception that His Excellency was holding for the new Spanish military governor of the Campo de Gibraltar, General Agustín Muñoz Grandes, making his first official call since his appointment. Muñoz Grandes was a VIP guest and the Fortress was keen to establish good relations. At the personal request of both Admiral North and Governor Liddell, Somerville invited the Spanish military governor to pay a visit to Ark Royal on some future occasion, explaining that: ‘This was, in a sense a quid pro quo for [Muñoz’s] concurrence in the use of the Racecourse by British fighter aircraft.’ The ‘neutral ground’ between Gibraltar and Spain was contentious. It mattered to keep on side with a man who would not make a fuss over British aircraft landing and taking off. But not only the perfidious English could play a double game. While the Spanish general was hobnobbing with the British like a good neighbour, his subordinates were escorting the German officers in mufti who were preparing their military attack on Gibraltar. Muñoz Grandes was supremely pragmatic. During the civil war, while he was being held by the Republicans in the Modelo Prison at a time when extreme leftists were murdering prisoners, he realised it would be fatal to act the rigid, polished officer, so he went shirtless, unshaven, in alpargatas, rope-soled sandals. He duly survived. In August 1940, England had not surrendered, but Germany had not yet won the war. It was prudent to get on with both sides. Admiral Wilhelm Canaris returned to Spain from Germany for another week, following up Richthofen’s talk with Vigón and telling him that Hitler wanted to go ahead with the attack on Gibraltar, but that Spanish roads and airfields first needed to be improved and maintained. Vigón asked for two hundred large-calibre artillery pieces, one hundred anti-aircraft guns and three squadrons of sea-planes. Canaris then went down to Algeciras again in plain clothes to make sure the Abwehr kept its surveillance low-key so as not to alert the British to what was afoot. Canaris’s report to Halder on 27 August made pessimistic reading: Franco would not come in until Britain was defeated, because he was afraid of what the Royal Navy’s battleships and aircraft carriers could do to his ports and supplies. Spain’s internal situation was bad, with many in the army and the church opposed to Franco. Canaris said Franco’s only real support was the Interior Minister Serrano Suñer and even he was really more pro-Italian than pro-German. Canaris concluded that Franco would be ‘an ally who will cost us dearly’. The German foreign intelligence service, army and air force were not the only people reconnoitring the Rock. On 6 September 1940, in his fortnightly meeting with the Führer, Grand Admiral Erich Raeder, head of the German navy, presented the Kriegsmarine’s ideas for waging war against Britain if Operation Sealion, the invasion of England, were to be called off. First on Grand Admiral Raeder’s list was action against Gibraltar and the Suez Canal, in order to exclude Britain from the Mediterranean. 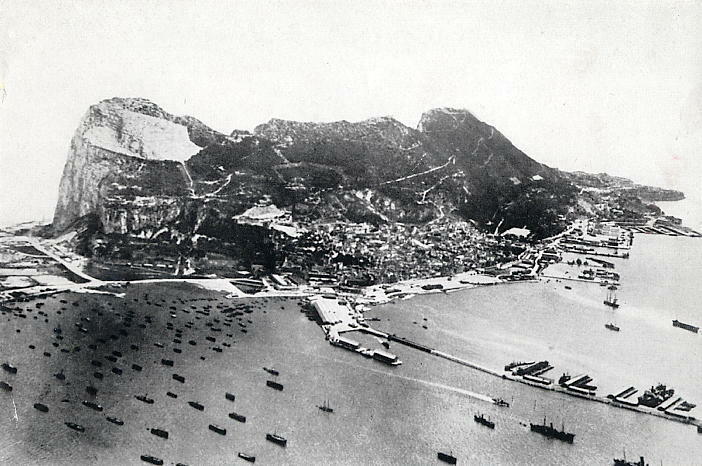 ‘The loss of Gibraltar would mean crucial difficulties for British important traffic from the South Atlantic.’ Preparations for this operation should be made at once, Raeder urged, reporting later that ‘The Führer gave orders to this effect.’ General Wolfram von Richthofen was once again sent back to Spain to see General Franco in person. The two men met in the Basque country that the Condor Legion had helped Franco to conquer, at Generalísimo Franco’s residence in San Sebastián, the Palace of Aiete, where King Alfonso XII and Queen Maria Cristina used to summer. In early September 1940, as the Luftwaffe launched flight after flight into the Battle of Britain, Franco flattered Richthofen by saying he thought Germany would beat Britain in about three weeks. But he told Richthofen that he was still reluctant to join the war, because Spain was so desperately short of food, fuel and other materials.